« Hibernation – Why Not Me? In 2006, Paul Rothemund at the California Institute of Technology, discovered “DNA origami,” where the Watson-Crick base-pairing rules are exploited to create molecules from viral DNA in specific 3-dimensional shapes. The molecules use small, “staple” strands to bind longer strands and hold them in place. In 2009, chemists and nano-technologists at the Danish National Research Foundation’s Center for DNA Nanotechnology then used DNA origami to create a nano-cube that self-assembled, using staple strands to open a lid. The Harvard group wondered if there was a way to deliver a nano-cube “robot” to cancer cells and kill them. This is where the immunology expertise paid off: antibodies patrol the bloodstream, honing in on specific cells, binding to them, and signalling them to self-destruct. 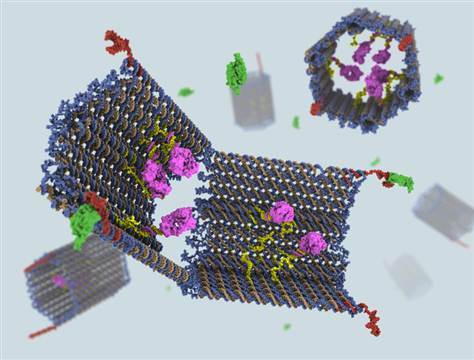 So how can a DNA nano-robot deliver antibodies to the surface of cancer cells? Remember the cube’s lid? “We could actually make an open-ended container and then all it would need to do is just turn itself inside out,” Douglas said. A visual rendering of the DNA "nano-robot." Image courtesy of the Wyss Institute. They created a “nano-clam” with antibodies waiting inside, ready to launch their attack. The nano-clam springs open when one of the staple strands is broken, just like turning a key in a lock. And the really clever thing? The lock can be designed so that the key is in the shape of certain cancer cells. So when the cube encounters a cancer cell, such as lymphoma or leukemia cells, it springs open, exposing antibody fragments to the surface of the cell in a “surgical strike.” Unlike chemotherapy, which doesn’t discriminate between cell types, these DNA nano-robots only strike down cancer cells, leaving good cells alone. Print article This entry was posted by Amy Nisselle on February 17, 2012 at 12:18 pm, and is filed under Inside Cancer. Follow any responses to this post through RSS 2.0. You can leave a response or trackback from your own site.